Defining the 'Strategic Partnership' (SP) took some 18 months after the Defence Procurement Policy (DPP) 2016 was released. The private industry that had been waiting with baited breath, responded immediately. 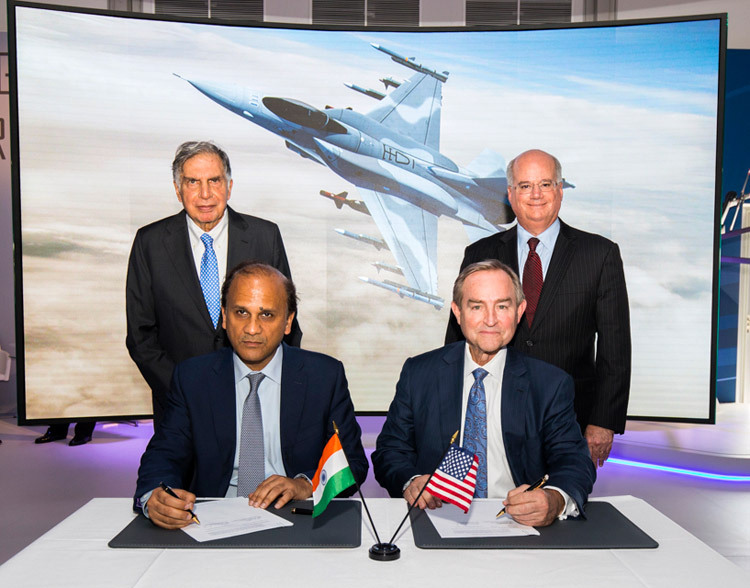 Lockheed Martin signed an agreement with India's Tata Advance Systems on June 19 to produce F-16 fighters in India, a week before Prime Minister Narendra Modi's visit to the US. The joint venture (JV) will produce the F-16 Block 70 aircraft, with Lockheed Martin planning to move all future production from US to India, placing the Indian Aerospace industry at the centre of the F-16 fighter aircraft supply base. India has not affirmed the F-16 Block 70 for the IAF. The Swedish Gripen-E fighter also is in the in the race. Now Reliance Defence Ammunition, subsidiary of Reliance Defence Limited (RDL), has entered into strategic partnership with Serbia's Yugoimport to manufacture ammunition in India. Yugoimport is a market leader in the field of ammunition production and has offered fully compliant technical solution to meet the Make in India requirements including transfer of technology (ToT). The RDL statement says, "Two companies will work together in the field of ammunition amongst others, with projected minimum requirement of Rs 20,000 crores from Indian Armed Forces". This is a positive development considering the army has been suffering from critical ammunition deficiencies. In 2012, the leaked letter from the Army Chief General VK Singh (now MoS External Affairs) to Prime Minister Manmohan Singh giving out deficiencies in tank ammunition, obsolete air-defence systems and inadequate weaponry for infantry and Special Forces battalions created ripples in the public. Recently, when Army Chief General Bipin Rawat made a statement that the military is prepared to fight a dual-front China-Pakistan war, he was criticized for making a 'political' statement with continuing poor state of weaponry, equipping and inadequate ammunition to fight such two-front war. In a further boost to Make in India, French electronics major Thales and Reliance Defence Limited (RDL) have announced intention to form a JV with proposed shareholding of 49% and 51% respectively, in consequence to the 'Offset' commitment by Thales as part of the Rafale contract. The JV will develop Indian capabilities to integrate and maintain radar and electronic warfare sensors. Given India's volatile neighbourhood, enlarging China-Pakistan anti-India nexus, and with the World Economic Forum predicting India as the third largest economy by 2030 ($19.511 trillion), sky is the limit for Make in India in the defence sector. Defence Minister Arun Jaitley, who recently led a delegation to Russia called upon the Russian industry to invest in Make in India, even as $10.5 billion worth projects with Russia coming through; air-defence systems, frigates; Kamov helicopters etc. PM Modi's forthcoming visit to Israel too will similarly boost India-Israel defence cooperation. However, much more work requires to be done to streamline 'Make in India' in Defence, without which its execution may be patchy as the DRDO. Earlier, the private industry was sidelined with everything routed "through DRDO". Later, DPP's relaxed the rules somewhat but awarding contracts to private industry remained largely symbolic. The Dhirendra Singh Committee had recommended 'Strategic Partnership' exclusively for the 'private industry' but the government has eventually allowed the DRDO-OF to come in through the backdoor, despite the poor record of the DRDO. To replace the unwieldy 7.62mm SLR which the army carried for decades, the DRDO took 15 years to develop the 5.56 INSAS rifle despite having been provided 17 state-of-the-art 5.56 assault rifles from 11 countries in 1985. It should have shamed the DRDO that even the Nepalese Army rejected the INSAS when offered to them. Despite, the MoD having approved the import of state-of-the-art assault rifles for the army, the DRDO managed to scuttle and delay procurement of such vital weaponry by offering tinkered versions of the INSAS, in Excalibur and now the Excalibur II (termed R2), both of which have been rejected in trials. Had it not been for Dr Shantanu Bhowmick of Amrita university, there was no way DRDO could have developed the Ultra Light Weight High Temperature Resistant Thermoplastic Polymer-Carbon Fiber Composite bullet proof jacket which has just been cleared for production. It is high time the DRDO-OF are largely privatized. In February 2017, the PMO had asked for the list of OFB products, plants, machinery and land held by the 41 factories operating under the Department of Defence Production (DoDP). Over 80% of the OFB's orders come from the Indian Army. Yet, these 41 factories meet less than 50% of the Army's requirements. The government appointed Vijay Kelkar (former revenue secretary) headed committee in 2005 had pointedly recommended privatization of the ordnance factories but this never came through because of vote-bank politics. Presently, with the Modi Government showing inclination towards privatizing ordnance factories, protests have been going on by employees of these ordnance factories. However, it is still not clear if the government will corporatize the ordnance factories; merge the 41 factories into a conglomerate along the lines of other DPSUs. Actually, the DRDO should be focused only on futuristic R&D, leaving the production to the industry through strategic partnership under Make in India. However, given the fact that the DRDO has managed to enter the SP through the backdoor, how many and how soon these 41 ordnance factories can be privatized / corporatized, remains a question. Developments like the indigenous 'Dhanush' 155 mm gun, which is upgraded version of the Bofors howitzers should not be used as excuse not corporatizing the ordnance factories. Could the existing provisions of the DPP not have catered for the elaborate exercise of the SP by simply authorizing the MoD to allow foreign OEMs to select Indian private companies as production agencies. Clearly, much more thought is required, including devising a road map for meeting defence requirements holistically.